Once a year the Formula One Grand Prix circus has to face up to the challenge of the 22.835 kilometres of the Nurburgring and they usually manage to come away reasonably unscathed and occasionally with a feeling of a job well done. Even after the Nurburgring's wild and craggy nature was somewhat tamed by the monumental facelift and tidying up process that was carried out in 1970/71, the new-look Nurburgring produced an even bigger challenge by being so much faster than before, with the lap speed average around 120 m.p.h. This year, however, the majority of teams came away, bowed, bloody, and humiliated, wondering if the Nurburgring wasn't more than they could cope with. Apart from a brief rain shower on the first day of practice the Eifel mountains were enjoying a heat wave and the Nurburgring was at its best, drawing a record crowd estimated at 400,000. Even if the estimate was wildly optimistic and was 100% out, that still leaves 200,000 people, and certainly the traffic flow towards the Nurburgring was very heavy before practice even started. Apart from Team Surtees everyone seemed to have recovered from the Silverstone shambles, and BRM were still awaiting delivery of sufficient power to make their car competitive; as someone remarked, "they'll wait for ever, unless they fit a Cosworth engine". John Watson was on loan to Team Lotus for this race, if only to prove that the 1975 Lotus trouble has been in the cockpit, and the bearded Irishman proved just that, making Peterson remove his Swedish finger a bit, but not enough to catch the newcomer. There were a lot of drivers who felt they could or should win the Grosser Preis von Deutschland, in particular Jochen Mass, who lives in nearby Cologne. It was not for want of trying that he did not succeed, for he was flinging his McLaren round the 14-mile lap with impressive confidence, but his enthusiasm got the better of his skill and he flew off the road during the Saturday morning practice. His compatriot Hans-Joachim Stuck was equally keen to win his own Grand Prix, but not so obsessed and merely got on with the job. Scheckter really felt he could win this one, especially as he held the lap record from last year in 7 min. 11.1 sec., and did a lot of practice in full-race trim as regards fuel load and tyre and suspension settings. Although the Tyrrell was a terrible handful on parts of the circuit, compared to a car that was set-up for practice laps, Scheckter was confident in the outcome. The Ferrari duo of Regazzoni and Lauda felt this race had to be theirs, Lauda's fastest practice time last year of 7 min. 00.8 sec. being the target of everyone to aim at, while his unofficial test-lap in under 7 min. was still waiting to be confirmed. Regazzoni may not be very high in some people's estimation as a driver, but he enjoys the Nurburgring and takes some beating on the mountain circuit. Practice had barely begun before Lauda set the standard with a lap in 7 min. 00.6 sec. and it was clear that anyone who could not improve on Scheckter's lap record was not going to feature in the start photographs. The practice system at the Nurburgring is that you can circulate round the short circuit comprising the Sudkurve and the Nordkurve, joined by the starting straight and the longer straight behind the pits, and when you feel ready for a full 22.835 kilometre lap you can peel off at the North Curve and set off over the bridge and down the swerves to Hatzenbach, but once over the bridge you are committed, there is no turning back. As the pits-loop is longer than the Mallory Park circuit or the Brands Hatch Club circuit it is easy to see why a lot of drivers are happy to keep circulating round the loop, needing to screw up all their courage to set off on a full lap. When you do set off it is with the full knowledge that you might never be seen again until practice is over, for if your car breaks down at an inaccessible point on the circuit you are stuck there, unless you can show resourcefulness like Patrick Depailler did in the first practice session. His Tyrrell broke a front suspension, letting that corner sag down, so he borrowed some tools from a spectator and slackened off completely the shock-absorber on the diagonally opposing corner at the rear and screwed up the other two corners until the suspension was virtually solid. This caused the car to sit lop-sided with the damaged corner up in the air and virtually off the ground, and that way he was able to drive slowly back to the pits. Apart from accidents to Mass, Brise, Ashley and Trimmer, whose cars had to be returned by the breakdown service, there was not too much trouble in practice and with a seven minute lap as the clear objective there was more than enough to get on with. In the last practice period Lauda and Regazzoni looked to have the front row of the grid once more, like last year, with Lauda at 7 min. 00.6 sec. and Regazzoni at 7 min. 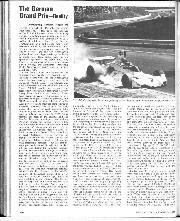 01.6 sec., but Depailler ousted the swarthy Swiss with a stirring lap in 7 min. 01.4 sec. and then Scheckter did 7 min. 01.3 sec. With barely time left for another full lap Lauda went out and put a stop to the challenging nonsense, as he did at Monaco and Paul Ricard, with a lap in 6 min. 58.6 sec. This really rocked everyone on their heels and represented a lap speed of 196.383 k.p.h. (approx. 122 m.p.h.) and it overshadowed a final effort by Carlos Pace who got round in 7 min. dead, relegating the two Tyrrells to the second row of the grid, while Regazzoni was back to the third row. Unless something untoward happened it looked as though Lauda was going to run away with the German Grand Prix like he had with the French Grand Prix. Sunday saw the Nurburgring in superb form, with not a cloud in the sky and every vantage point packed with spectators from all over Europe. Everyone set off bravely on a complete lap to warm up, apart from Ertl with his newly acquired Hesketh 308/1 and Pace, whose Brabham was suffering from fuel pressure trouble. Everyone got back to the starting grid safely and Pace and Ertl joined them. 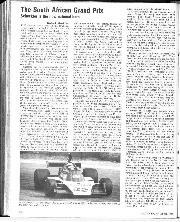 There were 24 cars on the grid for the 1.30 p.m. start as Ashley's practice accident precluded, him from taking part, and Tony Trimmer just failed to go fast enough in the Japanese Maki to qualify. While some drivers were uncertain about the start, Lauda made no mistake and shot off into the lead with Pace and Depailler hard behind him. Scheckter made a complete nonsense, nearly burning out his clutch and almost everyone passed him, while Peterson was left behind with a slipping clutch, struggling along after the tail-enders. Before the leaders had gone from the sight of the pits Depailler had moved his Tyrrell into second place and was hard behind Lauda's Ferrari as they started the first of the fourteen laps. Jochen Mass did not get far, as a front tyre burst at the bottom of the steep descent at Fuchsrohe and the McLaren M23 destroyed itself as it bounced about on the guardrails, the driver stepping out shaken but unhurt. Near the back of the field Donohue suffered a flat tyre on the Penske March 751 but managed to limp back to the pits. He had barely started his second lap when another tyre literally exploded, showering the track with bits of rubber and the March skated to rest at Aremberg. As the field started their second lap the order was Lauda (Ferrari), Depailler (Tyrrell). Pace (Brabham), Reutemann (Brabham). Regazzoni .Ferrari), Stuck (March), Fittipaldi (McLaren), Hunt (Hesketh), Jarier (Shadow), Brambilla (March), Andretti (Parnelli), Watson (Lotus), Pryce (Shadow), Brice (Hill), Scheckter (Tyrrell), Jones Laffite (Williams), Ertl (Hesketh), Fittipaldi (Fittipaldi), van Lennep (Ensign), Lombardi (March) and Peterson who stopped at the pits to see if his clutch slip could be cured. The Swede set off again, but it was useless and he returned to the pits by the North Turn slip-road and retired. 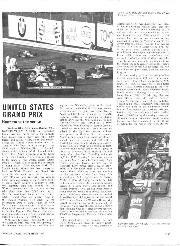 During the second lap Emerson Fittipaldi suffered a flat tyre and limped round to the pits after everyone had gone off on their third lap, except that is Mass, Peterson and Donohue who had all retired. Fittipaldi rejoined the race but was put off by a bad vibration that seemed as if it was going to shake the car to pieces, so after three more laps he gave up. On the third lap Watson had the front suspension of his Lotus collapse and was fortunate to slide to a stop undamaged, not far from Donohue's March, and Scheckter, who was just behind, had an anxious moment deciding on which side to pass the stricken Lotus. Brambilla ran into tyre trouble on this lap and retired, but near the front of the race, Regazzoni had stormed past Reutemann into fourth place, and Hunt had moved ahead of Stuck, and shortly afterwards the March engine broke. Andretti had to make a pit stop to replace a damaged wheel, caused when someone "nudged" him off course, and after five laps Regazzoni had moved up into third place, but not within sight of his team-mate who was still leading from Depailler. The Brabham of Carlos Pace had collected a puncture, and though he got back to the pits for a new tyre, it dropped him to ninth place and one lap later the rear suspension collapsed and stranded him out on the circuit. Depailler was really into the swing of the Nurburgring and was much too close to Lauda for the comfort of the Ferrari pit, for it is one thing to be a length behind on a slow hairpin but another thing altogether to still be that close on a 160 m.p.h. downhill sweep, as he was through Schwedenbreuz. At half-distance these two were out on their own, Regazzoni was safely in third place, followed by Reutemann and Hunt, though the Hesketh's engine was misfiring badly at high revs. 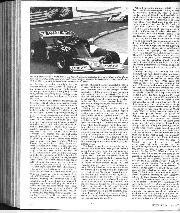 Then came Scheckter, who had fought hard up to sixth place, followed by Jarier and Pryce; Laffite was a lonely ninth and at intervals came Brise, Jones, Ertl, van Lennep, Lombardi and Andretti. During the eighth lap Scheckter had a high-speed spectacular accident "when something let go at the back" and Jarier ran over some of the wreckage and punctured a rear tyre. He limped the stricken Shadow along to try and get back to the pits but the flat tyre disintegrated and wound itself round a driveshaft and brought the whole lot to a grinding halt. The whole thing seemed to be getting too much for the "circus" and on lap nine Regazzoni's Ferrari engine lost all its oil pressure as he was starting the descent from the start and finish plateau. At this point he was actually in second place, for Depailler's Tyrrell had broken a top rocker-arm on the front suspension and the Frenchman had limped into the pits. Hardly had Regazzoni expired than Brise went off the road in a big way, wrecking the Hill but escaping uninjured, the crash being blamed on a rear suspension failure. Just when Lauda appeared to have the race all sewn-up it was his turn to collect a flat tyre and this let a surprised but happy Reutemann through into first place, followed by Pryce and Laffite, while Lauda limped along to the pits for a new tyre. In reality Hunt should have been in second place but the Hesketh was in trouble with what seemed like clutch-slip or wheelspin and though Hunt started lap 11 he realised he was not going to finish it and turned off at the North Curve slip-road and returned to the pits. All the driving pins in a rear hub had sheared, only the limited-slip differential allowing the car to drive along through one wheel. There were still three more laps to go and it began to look as if no-one would finish. 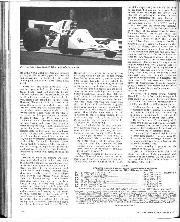 Team Tyrrell had obviously thought this and had replaced the broken rocker-arm on Depailler's car and put him back in the race, albeit a lap behind the existing leader. However, Reutemann had no intention of losing this race, and he picked a wary path over the stones that were causing some of the tyre troubles, stones swept onto the track by drivers sliding a rear wheel off the edge of the tarmac as they powered out of corners. In second place Tom Pryce was in real trouble for the fuel filler cap behind the cockpit was leaking and apart from sitting in petrol he was suffering from the fumes getting up into his helmet. In a dazed and uncomfortable state he kept going but was forced to slow his pace and Laffite passed him on lap 12 and Lauda passed him on the last lap, but the courageous Welshman kept going to the finish. He undid his safety harness (which must have broken a CSI regulation!) and drove along raising himself up into the wind and out of the petrol bath, finishing a praiseworthy fourth with petrol burns on his body. Reutemann made no mistake and came home a delighted winner a long way ahead of Laffite who had driven Frank Williams' car in his usual determined fashion and had profited from others drivers' misfortunes, much to the joy of Frank himself. Another struggling team usually at the back who enjoyed equal fortune was Morris Nunn's Ensign team, van Lennep netting a well-deserved sixth place with a non-stop run in the latest Ensign in only its second race. Almost unnoticed was Alan Jones in fifth place with the Hill car, having driven a good, tidy race without trouble and moving up the leaderboard as others fell by the wayside. On the penultimate lap Andretti coasted to a stop, out of fuel due to a leakage that had been seeping into the cockpit. Seventh and eighth were Lella Lombardi and Harald Ertl, the Hesketh driver having to ease up in the closing stages when he ran out of rear brakes. Last, but by no means least, was the dynamic little Patrick Depailler, a lap behind the leader but driving as hard as ever, because he is not one to give up in the face of adversity. When the dust had settled and the breakdown lorries were retrieving the wreckage of Benny Finkelstein's Formula One "Off-the-road" show, I was wondering whether the Nurburgring wasn't more than the Formula One circus could cope with, and rather than alter the circus and its performers, suggested doing away with the Nurburgring altogether and replacing it with a nice flat, simple Autodrome. 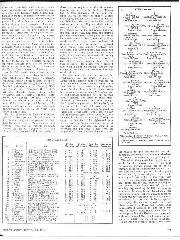 Surprisingly, there was a lot of opposition to the idea from certain drivers whose names begin with L, R, A, J, P, W, S, D, H, and M, who all want to accept the challenge of the Nurburgring. To round off the day the only tyre company supplying tyres to Formula One, so we know who had all the punctures, put out a statement supported by the GPDA. 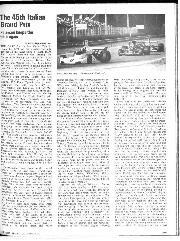 It said: "The high incidence of punctures in today's Grand Prix is attributed to flint and stones on most of the circuit penetrating the tyres. This condition has been referred to the organisers, and we understand steps are to be taken to eliminate this situation in future". My personal footnote to that statement is that those flints and stones were not on the track when the meeting started and I am sure the marshals did not put them on the track, nor did the spectators, so who did put them on the track if it was not the drivers themselves? When challenged the drivers said "He did it", pointing to the chap in front of him. Remember the same hoo-ha at Clermont-Ferrand, when Helmut Marko lost the sight from an eye? At a GPDA meeting it was asked why the driver who inspected the circuit did not report the loose nature of the edges of the circuit when he visited Clermont-Ferrand back in the winter. His honest, but unbelievable, reply was "Because there was a metre of snow there at the time"! Those flints and stones at the Nurburgring did not arrive on Saturday night; in fact, on Friday practice I saw drivers putting two wheels onto the loose stuff when leaving corners and after they had gone, hardworking marshals swept the road with brooms. With the cars running so close in the race it was not possible to sweep the track after each car scattered rubble across it. Having a monopoly on Grand Prix tyres is not all good for Goodyear, for though they can guarantee to win every race, they can also be blamed for losing races. They really are having a hard time right now, with tyres that could not cope with thunderstorms at Silverstone and tyres that could not cope with flints and stones at Nurburgring. When is somebody going to wake up and realise that the driver behind the wheel is the real master of a racing car's destiny? 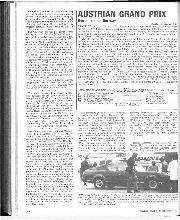 "Following the meeting at Le Castellet a delegation of the Formula One constructors met as planned with the attending members of the CSI on the occasion of the GP of Germany on the 1st August 1975. During the course of the meeting which lasted two hours, an exchange of numerous ideas allowed them to reach a full agreement on the objectives to be achieved and on the methods of achieving them. The discussion concerned mainly a study of short-term measures for next year, but there was also an exchange of views concerning the establishment of a basis for the future of Formula One. The next meeting is planned for the occasion of the GP in Italy." If you can understand what that is all about you will no doubt understand what happened at the German GP when the Nurburgring showed itself to be a force not to be trifled with.—D.S.J.